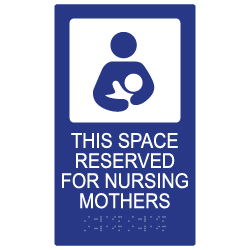 Our made-in-California ADA Compliant Room Signs and ADA Compliant Nursing Mothers signs are high-quality and professionally manufactured. Our ADA signs meet ADA sign regulations and will pass official Americans With Disabilities Act compliance inspections. Access to a private and secure room, other than a restroom, to express breast milk or breast-feed an infant child. Access to a place to store expressed breast milk safely. A lactating pupil on a school campus shall be provided a reasonable amount of time to accommodate her need to express breast milk or breast-feed an infant child. A school specified in subdivision (a) shall provide the reasonable accommodations specified in subdivisions (a) and (b) only if there is at least one lactating pupil on the school campus. A school subject to this section may use an existing facility to meet the requirements specified in subdivision (a). A pupil shall not incur an academic penalty as a result of her use, during the school day, of the reasonable accommodations specified in this section, and shall be provided the opportunity to make up any work missed due to such use.